Gosh, its just been one of those weeks- sick hubby, sick baby, lots to do- so little time. BUT guess what, now I am relaxing!!! Charli is sleeping, hoping Brad gets home soon, the dogs are snuggled up next to me, all is well. I could be working, ahh no thanks! 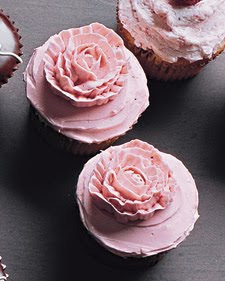 While relaxing I found myself searching for some new cupcake inspiration and found THESE.. gosh Martha I heart you and your creative team!